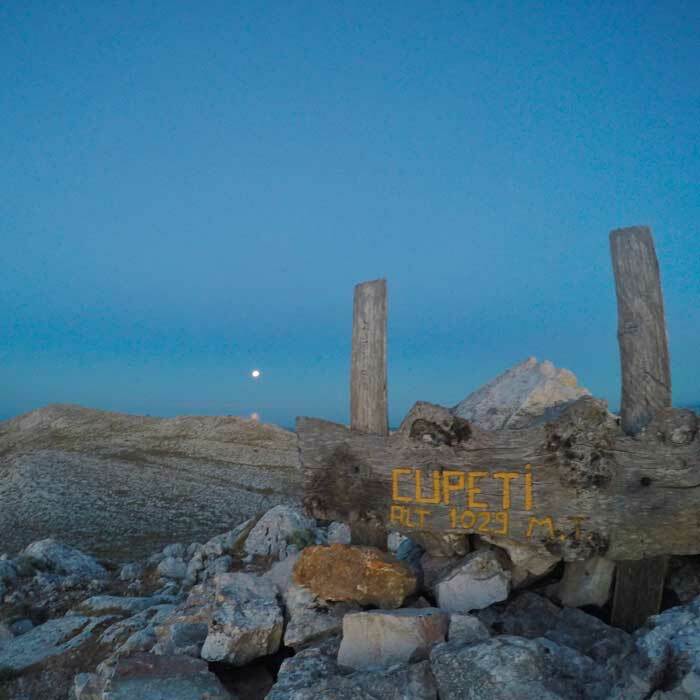 Follow the footsteps of Sardinian shepherds and the mountain trails of Punta Cupeti, the peak close to Montalbo di Siniscola. Discover ancient settlements and natural water springs. 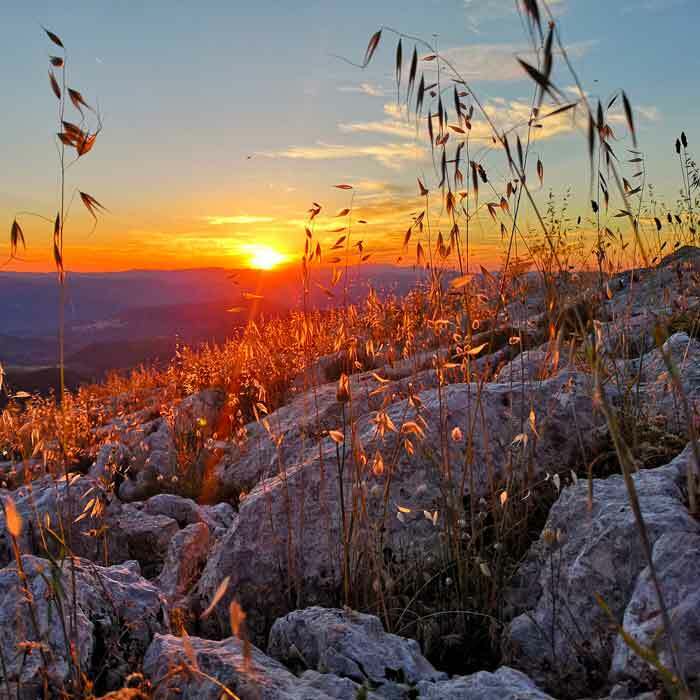 Get to the perfect spot to enjoy the sunset and the infinite landscape while tasting typical Sardinian food and wine. Tour that we run once a month during the full moon, starting at 6:30PM and closing around 11PM. Also available on request for groups of 4-8 persons. Pick up at your hotel with our tour van, and transportation to the beginning of the hiking trail. We’ll walk all the way with you to make sure you will enjoy an unforgettable Sardinian slow experience. Trekking suitable for everybody. 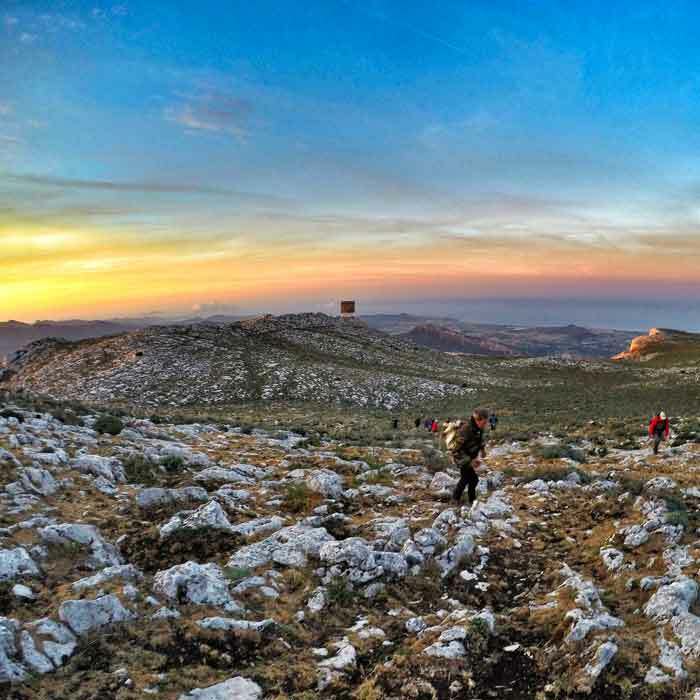 We will walk for 45 minutes on mountain trails (1h30m including return) that include panoramic stairs on the last leg to the top of the mountain. We will see ancient remains of shepherd activity and the famous Pinnatu (old shepherd’s hat) at Sas Vininzolas. 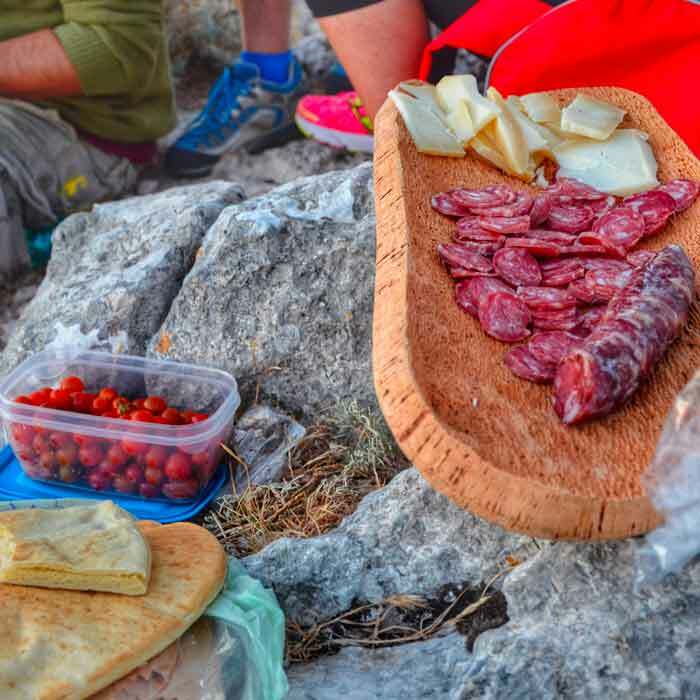 After a short walk, we will arrive at the peak of Punta Cupeti (1,029 mts), where we will taste typical Sardinian food such as shepherd’s bread pane carasau, Sardinian cheese and sausages, sa pompìa (a unique citrus dessert from Siniscola), and some good local Sardinian wine. Back to the van, and drop off at your hotel. Tour highlights: Pinnatu, Sas Vininzolas, Punta Cupeti, natural water spring, typical Sardinian food and wine tasting. Tour duration: 4h30m (6.30PM-11PM), including van transportation. Trail difficulty level: Easy / Medium. Suggestions for this tour: Wear good hiking shoes (no open shoes, sandals or flip-flops) and comfortable clothes. Carry one bottle of 1.5 lts. drinking water per person. We loved hiking and chilling with Jay on the Montalbo Sunset tour, that Jay enjoyed even more as he got into the monthly full moon tour! 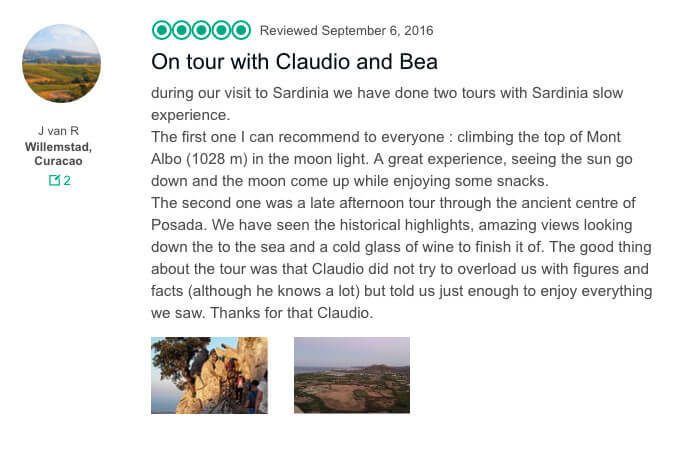 Read what he sais on his great review on Tripadvisor about his Sardinian Slow Experience with our Montalbo Sunset Tour.